Home United showed their title credentials on Tuesday night as their short trip to Hougang yielded a win by five goals without reply. The result meant Home provincially went top of the league while for the Aide Iskandar-led Hougang United, it is back to the drawing board as the team has now shipped five goals in each of their last two games. His team was not aided by the sending off to defender Ratna Suffian for two bookable offences in the first half. Protectors coach Lee Lim Saeng made two changes to his starting lineup from the last game, introducing Qiu Li and the hardworking Firdaus Kasman into the team. Both were to go on to make their mark in the game. Hougang was missing their foreign legion upfront as Diego Gama and Mamadou Diallo were both sidelined with injuries and Jordan Webb was only fit to make the bench. In their absence, Aide fielded a makeshift strike force consisting two of his more impressive players so far this season in rising star Basit Hamid and former Protector Azhar Sairudin. Basit, though still raw in the professional league scene, did well against Kenji Arai and Valery Hiek as he caused the seasoned duo into making a few defensive errors. One of it happened in the 30th minute as Basit stole the ball from an innocuous situation and set up Azhar who could only slot it into the side-netting. It was a let off for Home. However, by this time, the Protectors had already taken the lead. In the 18th minute, from a good 30 metres out, Firdaus unleashed a stunning blaster to the top corner which left Hougang keeper Fadhil Salim grasping thin air. Qiu, cheered on by this family in the stands, was slowly coming into the game. A mazy run from his own half to the danger area in the 38th minute almost reaped rewards till he lost his footing just as he attempted to shoot from outside the box. A minute later, centreback Ratna was shown a second yellow card following a tangle with Home’s Sufian Anuar and subsequently sent off. There was still drama in the first period as Hougang was awarded a spotkick on the stroke of halftime after winger Fazli Jaffar was tripped in the box. However, Argentinian import Carlos Delgado’s decent effort was equaled to by Lionel Lewis as the national custodian parried it clear. Despite the setback, Hougang came out of the dressing room looking to tie the game up but Carlos’ volley in the 53th minute was again denied by Lionel after good work by Noor Ali. Not to be outdone, Fadhil also showed his class by superbly denying Qiu twice in the 55th and 64th minute. Home had got their second for the night in the 68th minute after a mixed-up in the Hougang defence following a Qiu cross off a corner situation resulted in an own goal ultimately credited to Azhar. Fadhil was again called into action in the 78th minute to deny Jumaat Jantan. A minute later however , the Hougang goalkeeper undone his good work as a blunder off a corner allowed substitute Firdaus Idros to head home for 0-3. 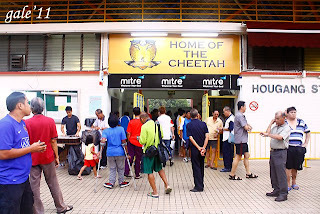 Home was comfortably in control at this stage and starting to display some flowing moves as they sort to take advantage of the space granted to them by a Hougang side searching for some scant consolation. Qiu then got his name on the scoresheet in the 86th minute, coolly slotting home after cutting in from the left wing and playing a neat one-two with substitute Asraf Rashid. Then in injury time, Asraf capped a flowing team move by curling home a sweet left footer from the edge of the box to seal the victory for his team. Hougang almost gave their fans something to shout right at the end but Webb’s volley just missed the post after excellent play from Fazli. In his post match interview, Coach Lee credited his players for the morale-boosting victory. “Our play is not yet perfect, but hopefully we can improve it in training and go on to be champions”, he commented. Lee also expressed satisfaction by the minutes contributed by his bench. “They(substitutes) are beginning to understand my instructions, and how I want them to play”. On the other end, Hougang coach Aide Iwas visibly dejected. He also lamented on the penalty miss just before halftime, “If we had made it one all, Home would have been forced to come out to attack us. In the end, it really was not our day”, he added while accepting responsibility for the defeat. The former national captain would have a few days to sort things out before bringing his team to take on Etoile next Monday night.